This is a continuation of my Cypher System Fantasy quick conversion of the Dungeon Crawl Classics RPG adventure, Sailors on the Starless Sea by +Harley Stroh. I truly believe this to be one of the greatest adventures ever written, especially after running it with the Cypher System. Designed for a DCC "0-level funnel" (low-level character grinder), this adventure scales perfectly for higher level play. Definitely worth picking up, no matter what system you use to play fantasy games! Before we move into the meat and potatoes of this post, I need to bring up Monte Cook Games' current Kickstarter campaign: Worlds of the Cypher System! The first Kickstarter supporting the Cypher System Rulebook, Worlds of the Cypher System (already funded) is going to introduce three new and interesting settings: Gods of the Fall by +Bruce R Cordell, Predation by +Shanna Germain, and Unmasked by +Dennis Detwiller. "Awaken your divine spark, claim a dominion, and become a god in a fantasy world in which the heavens smashed upon the Earth like a vengeful star. Or drift to the edge of insanity. They'll say you're dangerous. Insane. That you suffer from Dissociative Mask Disorder. Your parents and the doctors and the press and the military—they can’t believe what’s happening. They can’t believe what you can do. And they wouldn't believe the price you pay." In full disclosure I'm backing to get all three settings. Even though I'm not sure if I'll play each of these completely as written, given the cross compatibility of the existing Cypher System settings (Numenera and The Strange), I'm sure I'll have a use for everything. While this Kickstarter directly supports the Cypher System Rulebook, fans of The Strange should be especially geeked, since each of these would make for an exceptionally robust Recursion! 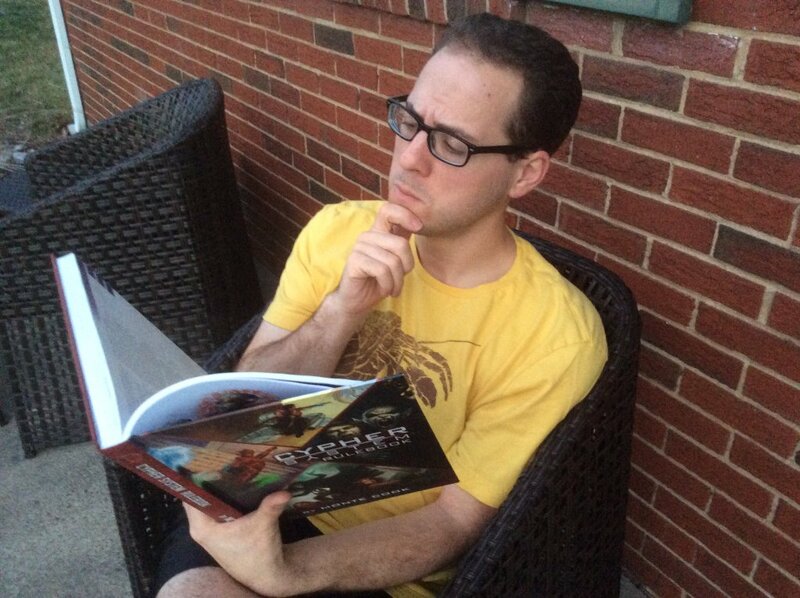 This is the main reason that I'm a backer, since I'm always looking for recursion fodder for my games of The Strange. You never know when you might need a new world for your agents of the Estate. ... don't wait for me, just go read the adventure recap and we can discuss The Strange later. Following the epic battle with the bestial humanoids, the brave adventurers from the Citadel Hazurrium needed a few moments to rest and catch their breath. Fortunately Sister Sariety's healing abilities cured many of the wounds. Once everyone was ready to move forward, the troupe chose to finish exploring the upper level of the fortress before delving into the underworld. "... and death shall pass." At first the party tried dropping Verrenn's disembodied head on the coffin, thinking that perhaps it would pass through. Zamani noticed that the lid of the coffin could potentially be pushed open with the right amount of force, and Yaren was glad to be off assistance. The warrior shoved the lid off the coffin, revealing the withered remains of an ancient Ugallu. Yaren quickly jumped back as a puff of deadly mold spore wafted up out of the coffin, while everyone else looked on in horror. "Nabakaani, the Ugallu Lich!" Zamani exclaimed with fright, backing away unable to look at the remains any longer. The Ugallu monk knew that his ancestor Furrcani destroyed Nabakaani the Warlord while he was still alive, but there were many tales of horror that still haunted Zamani's family. He wanted no part of the lich, even if he were no longer a walking undead. ... The Spellbook of Ineffable Evil! Verrenn opened the book, and realized that it was one long set of directions on how one could become a lich. Such a book could come in handy, especially if one wanted to reverse a similar process. ... or so he thought. When Verrenn recited words of power from within the Spellbook of Ineffable Evil, the dark magicks of... darkness... arose from the depths of the underworld and transformed the well into a Well Golem! Zamani used his wind punch to shove the Well Golem away from the party, but it just charged back into combat, now wielding the lid from Nabakaani's coffin. The team tried sword and claw, spell and fist, and nothing seemed to cause any considerable damage to the golem. The construct's stony armor was just far too strong for conventional attacks. Verrenn decided to try attacking the monstrosity's power source, rather than its body. Using a countermeasure incantation, the spellcasting undead rolled up a ball of inverse magical energy, and targeted the Spellbook of Ineffable Evil. The attack worked! With the book destroyed, the Well Golem crumbled into dust. One by one the party members scooped up bits of Well Golem after realizing that they could possibly use them as Enduring Shield cyphers later in their quest. With the courtyard completely cleared, the adventures gathered themselves and headed down the long staircase into the depths below Baezedaar Keep. Traversing several hundred staircase, eventually they came to a long room covered in grand mosaic carvings. A murky pool rested in the center of the room, and a portal on the opposing wall led to more stairs. Verrenn and Zamani examined the mosaics, trying to make sense of the strange images. The pictures told the tale of how a great dragon would be summoned at a tiered-pyramid, commanded, and then sent to a world full of illuminated spires to perform acts of destruction. The party briefly considered sending one of their own into the pool to explore its depths, but eventually moved on to the next series of stairwells. At the bottom of the stairs the adventurers found a small beach adjacent to an enormous underground sea. A large stone alter rested at the edge of the water, and an ancient, oared longship floated fifty feet offshore. In the distance, far across the sea, the sound of drumming, moaning, and screaming could be heard. With no time to lose the party lit a candle on the altar, causing the longship to come to shore. Each adventurer boarded the vessel and set off for the terrifying sounds. After a half hour of rowing the crew of the magic longship discovered an incredible site. A large, tiered pyramid, similar to the mosaic, rested on a small island in the center of the sea. Crazed bestial humanoids covered the pyramid, many appearing to be drunk or in a daze. Looking closer, the party also saw many dead humanoids, as well as normal humans, covering the pyramid. Most looked partially consumed, or torn apart. At the top of the pyramid a small group of beastman cultists were concluding the rites of dark ceremony. Whatever happened here was over, and the party was too late. Hoping to find out more, Shenuesh jumped from the boat to the shore, and quietly investigated the scene. Zamani didn't want to be left behind, and figured that his cat-like form made him look a little like a beast man. The monk followed the lycanthrope and donned some of the cultists' clothing. Climbing to the top, Zamani could make out what appeared to be claw marks covering the dead cultists and humans. Some had been bitten, with their remains nowhere to be found. Once at the top of the pyramid, Zamani was mistaken for another initiate. The high priest was praising something called "Rhilon" while he commanded the other initiates to clean up after the ceremony. Just to the left of the main alter was a large ornate box, with five bracers nested in velvet. Judging by the indentation, there was a place for a missing sixth bracer. Zamani went to steal the chest, but accidentally knocked it off of the platform. The great box tumbled down the tiers of the pyramid, bowling past bestial humanoids and captive slaves, until it struck Shenuesh. The weight of the chest dragged Shenuesh down into the murky waters, but the lycanthrope's adaptive nature allowed him to exist quite comfortably beneath the waves. At first Zamani was relieved that his friend was alright, but then he noticed that the cultists had all turned their gaze to the Ugallu. The bestial cultists were clearly outmatched. Zamani threw the first punch, using his inner energy to launch the high priest fifty feet out and away from the top of the pyramid. Yaren played crossbow target practice with the remaining cultists, and Verrenn set several on fire with his arcane flare. Even the typically pacifistic Sister Sariety let loose a few crossbow bolts. When the last beastman fled, Zamani returned to the longship. Shenuesh arrived not long after, bearing the great chest. Verrenn looked at the strange artifacts, and remembered them from the histories of Ardeyn. "The Baezedaar Bracers," Verrenn exclaimed. According to Ardeyn lore, these bracers had the power to transport the wearer somewhere spectacular, quite possibly a lost moon. If the cultists used the missing bracer on "Rhilan", no doubt the terrible entity was on its way to this unknown world. Verrenn wasted no time putting on one of the bracers, and he immediately disappeared! Shenuesh wanted nothing to do with these artifacts. The weretouched warrior wasn't about to visit a lost moon anytime soon, and he was dumbfounded at the gullibility of his fellow adventurers. Yaren followed his undead grandfather, stirred by words silently whispered by Sister Sariety. Shenuesh's mouth fell open in horror as he watched the Sister next whisper in Zamani's ear. Immediately the Ugallu placed the bracer on his wrist, disappearing in a flash. What was the Sister doing? Shenuesh thought. Foul treachery! Smiling, the Sister next whispered in Shenuesh's ear. "I think you should wear the bracer," she stated. But Shenuesh refused. The lycanthrope backed away, unwilling to fall for the Charming Speaker's poisoned words. That's when she pulled out the small pouch of slave-making powder discovered earlier in Nabakaani's tomb. Sister Sariety threw the powder in Shenuesh's face, and then commanded him to wear the bracer. As soon as Shenuesh disappeared from Ardeyn, Sister Sariety followed. Maybe we are not to late, she thought. Agent Evan Calders of the Estate lay bleeding on the ground. The sound of gunfire continued all around the young operative, drowning out the roar of the great dragon as it tore through the roof of the small nondescript office building in Alexandria, Virginia. The terrible beast came through the gate unhindered by the standard physics of Earth. There was no translation, no shift to a more Earthlike form. There was just the dragon, rising into the night sky, it's escape covered by these maniacal, gun wielding cultists. Just then, there was another flash... then another... and another. More souls coming through the inapposite gate. The first was a spectral undead creature, oozing with ectoplasmic form. The next a stout knight, clad in great armor wielding a sword and shield. A robed lion-man then appeared, followed by a rather docile looking werewolf. Finally Agent Calders saw her: a plain, ordinary sister of some fanciful monastic order. The cultists turned their guns away from the dying agents of the Estate, opening fire on the fantastic newcomers. Agent Calders watched as the sister covered her face with a stone bracer just in time. The shock of the bullet shattered the bracer, causing an amazing transformation of light and magic. Where there was once a simple, middle-aged nun, there was now a young blond teenage girl. It was Gabbie! "Gabriella," Agent Calders screamed out just before taking another bullet. "You're too late. Run!" "Andy, use your magical abilities to help him out." - Frank to Andy, another "Zamani is a mage" inside joke. "Now listen, if anyone wants to touch me now, appropriately..." - Frank begins a statement. "That's something about 'and death shall pass.' Maybe we can just drop Verrenn's skull on it and it will drop through." - Jeremy reasoning. "Did we just walk into a Japanese horror movie?" - Marc thought the GM's art looked like Godzilla and not a dragon. "It's not as powerful as a 'Well Golem,'" - Words Marc never expected to hear before this game. "I could just see all five of you standing in line at Starbucks." - Jim on the actual characters going to Portland instead of Alexandria. After several months, and ten play sessions we are back in The Strange! I guess to be technical, we've been in The Strange all along but only two of us really knew the truth: me and Frank. Frank's concept of Gabriella (a teenage character he's played in several other systems and settings) formed the basis of Sister Sariety from the beginning, and the two of us have been waiting for this reveal for quite some time. I've wanted to do an Ardeyn native campaign in The Strange ever since the corebook arrived at my house in the summer of 2014. But since I play with a crew of Cypher System veterans, I thought it would be impossible to spring any kind of surprise. 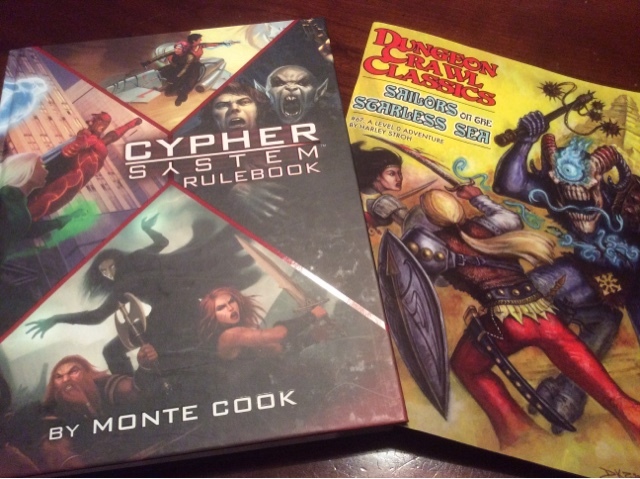 Cypher System Rulebook to the rescue! Some of my players admitted that they thought something was up, as I had dropped hints here and there, but for the most part I think I pulled off a successful reveal. To make the game even more interesting, I have the Baezedaar Bracers acting as miniature "gateways", transporting the magic from Ardeyn into the characters so that they do not translate but still retain all of their powers. I love the idea of fantasy characters running around a modern Earth, wielding crazy arcane magic... its just so "Highlander" or "The Last Witch Hunter." ... or better yet, come find me on G+ and I'll run you through an epic game of Cypher System Fantasy or The Strange!